Don't want to miss anything new? Enter your email address to subscribe and receive notifications of new posts by email. I’ve recently had myself a little Gulzar festival. I started with Koshish two weeks ago, and continued with Palkon Ki Chhaon Mein (directed by Gulzar’s assistant Mr. Meraj) and Parichay this weekend. All three movies are sweet, simple, wholesome entertainment. I have a few more of his movies in my stack to watch (and he’s still working!) but it’s time for another post for the two or three people who read this blog. 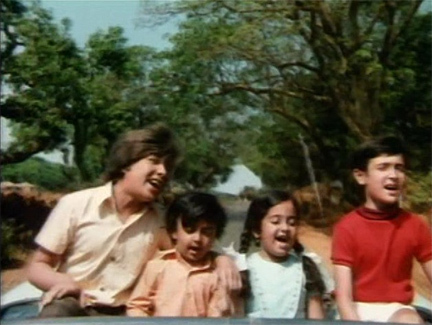 Parichay is The Sound of Music meets Hindi cinema, with Pran as Captain Von Trapp and Jeetendra as Maria Ravi the tutor hired to tame five wayward children. 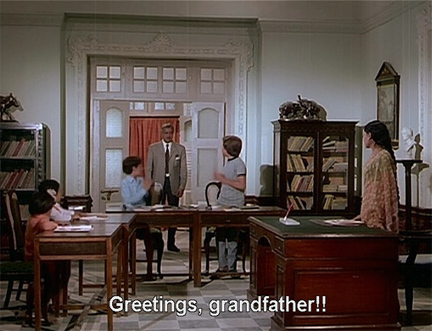 Pran is actually the children’s grandfather in this Indianized version, who was alienated from his son (Sanjeev Kumar) but took in the children when his son died. He gives a very good performance as a man whose rigid pride and code of ethics has caused a lot of suffering, to himself most of all. He melts like the ice caps in the Arctic. Meanwhile, back in the city, Ravi misses Rama. His friend convinces him to go and visit, which he does, only to be told by Pran that he has arranged Rama’s marriage to the son of an old friend. Ravi leaves without meeting Rama, but when she finds out that he was there it becomes clear to Pran that she is in love with him and he manages just in time to reunite them. Parichay is a lovely movie, with solid performances and beautiful songs by RD Burman: good timepass. And it’s worth watching for Master Raju Shrestha (little Sanjay) alone, who could bring out maternal instincts even in…well, me! Posted on August 7, 2007 at 1:24 pm in Hindi movies	| RSS feed You can skip to the end and leave a reply. I loved this movie, as I did all Jaya films, well, except perhaps her one Z-grade film, you would not believe it, called Gau aur Gori. Jaya will tell that it is her one embarrassing moment in films in any interview. I liked the song between Sanjeev Kumar and Jaya: these two certainly were more daring than their fellow actors, romantic couple in Koshish, and father-daughter not very long after! Spoiler: loved the tortoise prank! very enjoyable film. i thought pran & master raju stole the film, one of my favorite pran performances & the only time prans character ever made me weep at the end. i do like jeetendra. have you seen caravan with him & asha parekh. i thought that film was alot of fun. Yes, Pran and Master Raju really stole the show. I like Jeetendra too and I love Caravan. One of my favorites :-) Beautiful songs! hey this movie is already on the internet. i am currently watchin while writing this. just go to http://www.musicnmovies.com and follow the links to watch it. i absolutely love jeetendra. he is one of my fave stars. jaya is brilliant as usual and pran, well hes just pran, mindblowing. that little boy who plays the role of sanju is so cute. a beautiful movie that can be watched with the whole family. i highly recomend it, especially if you are a jeetendra fan. it is very heart warming to know that in todays age when there are meaningless crap being passed in the name films, still there are people who like clean and family films like PARICHAY. I would also like to thank eva and memsaab, that they have liked my acting in my very first film makes me feel very happy. It is heartwarming to me that you have commented here! :-) I will make the correction you mentioned to the post, thank you for pointing it out! Memsaab–Totally agree. 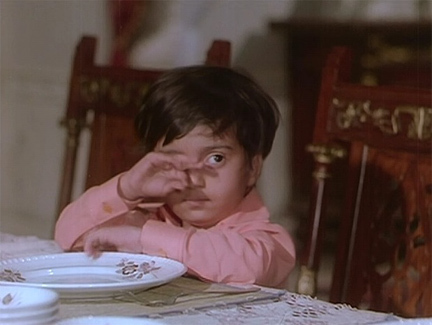 Master Raju was one of the sweetest child actors ever in Hindi cinema. Incidentally, could you please, please do a write-up of “Palkon ki chhaon mein”–one of my absolute favorite RKs. It’s hugely underrated but a gem IMO. Lovely, lovely songs, senstive performances, rural India (which they don’t do anymore, why? why?) I could go on and on :-) And Raju again as the little boy “Parcel”–priceless! I’m watching this on Youtube and it’s kept me watching for the past half hour … and look – it’s 1230 in the morning! Im watching this movie right now on the internet. i was going to watch love aaj kal but then decided to watch this instead. 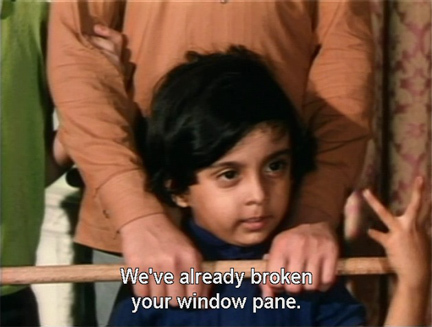 I absolutely love watching old hindi movies, especially ones like this one. Im really a rajesh khanna fan, but genereally love watching all hindi movies, old or new, good or bad. Ive grown up watching indian movies and they’ve been a huge part of my childhood. Although im only 20 years old i love watching old hindi movies and would probably choose and old hindi movie over a new movie any day. (especially if it stars rajesh khanna and mumtaz) I really dont know when my love affair with indian movies started but all i know is that jab se me hoon tab se yeh hai. I have got to say that the 70’s along with the 90’s was one of the best eras for bollywood , as some marvelous movies were churned out in these times. I was in bed around 1:30 last night so I watched about seven 11-minute parts last night. Here I am on NYE watching as much as I can while having a black currant martini! I’ll tell you how it was (the drink and the movie) when i finish! Please to notice that Master Raju even left a comment the other day above :-) He and Pran were my favorite things in it! Happy New Year! Prosit! Finally finished watching this and what a heartwarming story. There is a brilliant film by Gulzar called Kinaara. But for some odd reason, I can never find it in anywhere. Can anyone tell me where I can find the movie? After having spent two entire mornings pouring over your blog, I have finally found something additive to your so comprehensive writings. But more of my comment later. First, allow me to lavish my compliments. In today’s age of gen-X Indians rooting for the latest Hollywood flicks and the supposed connoisseurs turning towards European and Japanese flicks – I had been feeling increasingly lonely. Who loved the Indian oldies? Those adorable, wonderful actors? Those amazing songs? It seemed – fewer and fewer people around me. And then in the midst of all this, I find this! Trust me, the few like-minded people around me have already been mailed the url of this site :) Can’t express in words how much I have enjoyed reading what you wrote. And now for my additive comment – it is Vinod Khanna – later to become a superstar in his own right – as Jeetendra’s buddy. The carbon-frame glasses and demur kurta-pajama don’t hide his charm! Hooray Deepti!!! I am very happy to have another oldies fan join us here :) I look forward to learning a lot from you too!!! Thanks for a nice sequence to PaRichay. Sorry, i only know few films of this era. Previous to PaRichay i’ve seen Bobby, which has some similarities, like the stern Pran father, the bourgois setting and the handpainted countryside backdrops. I felt that Bobby has somewhat more substance. Finally i feel that PaRichay is a movie, like so many, where kids and actresses are somewhat restrained. Even though they do pranks and all, it seems to me one of so many Hindi movies with monodimensional cute kids appealing, probably, to maternal instincts :). Monaural kids like them even pop up in Karan Johar’s films (better youngsters i only remember from English Babu… and Taare Zameen Par). Also here Jaya Badhuri to me seems very restrained and lifeless (more than Indian society may have demanded). Just as she seemed restrained and lifeless a good 30 years later in Kal Ho Naa Ho. I still think it is a nice movie, especially when Jeetendra moves in. But i never was wowed by any actor here. 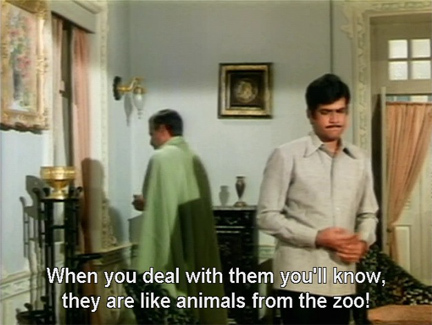 Well you should watch Gulzar’s adaptation of Shakespere’s Comedy of Errors in “Angoor”. Double Sanjeev Kumar, Double Deven Verma is Four times the Fun !! !